The Syrian government has suspended the evacuation of civilians and fighters from eastern Aleppo, accusing rebels of breaking terms of the ceasefire. 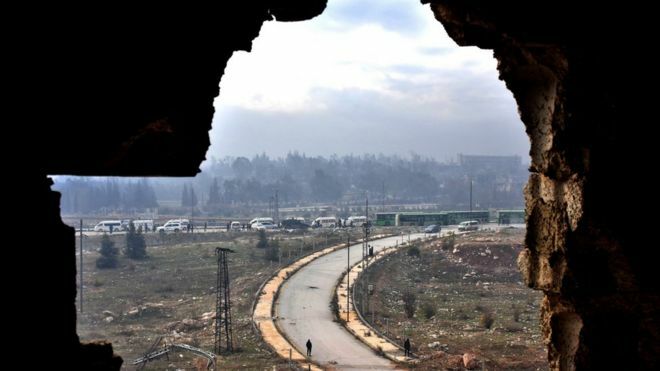 Government sources said rebels had blocked the evacuation of civilians from two pro-government towns elsewhere in Syria, agreed under the deal. Meanwhile buses carrying people from eastern Aleppo were fired upon. At least 6,000 people have left the city since Thursday, but the UN says at least 50,000 are still trapped. Syria’s army, backed by Russia, has taken nearly all rebel-held districts in eastern Aleppo. Various reasons for the suspension of the delicate evacuation operation from the city are emerging. State TV said rebels had tried to take captives with them as they left the besieged enclaves. Meanwhile, a military news outlet affiliated with the Syrian government said protesters had blocked a road being used to evacuate fighters and civilians, demanding people be allowed to leave the mainly Shia towns of Foua and Kefraya in Idlib province – an area in the north-west controlled by rebels opposed to President Bashar al-Assad. Syria’s government and its ally Iran had insisted the evacuation from eastern Aleppo could happen only with the simultaneous evacuation of these two towns. What’s happening in Foua and Kefraya? Speaking to a UN news conference by telephone from western Aleppo, World Health Organisation official Elizabeth Hoff said the planned evacuation of sick and wounded from eastern Aleppo had been halted on orders from Russian forces, and that no reason had been given. “There are still high numbers of women and infants – children under five – that need to get out,” she added. Many thousands of people, including a large number of civilians, have been killed during the fierce fighting in Aleppo. US Secretary of State John Kerry has accused the Syrian government of carrying out “nothing short of a massacre” in the east of the city. Syria and Russia have repeatedly denied targeting civilians there. Meanwhile Russian President Vladimir Putin called for all sides to agree to a complete nationwide ceasefire on Friday. Speaking during a visit to Japan, he said that Russia and Turkey were working to launch a new round of peace talks between the Syrian government and the opposition in Kazakhstan. This would be in addition to the UN-run efforts in Geneva.